Dug out of the 'rock room' archive today comes a live 'Pink Floyd' recording from 1967 featuring founding member Syd Barrett. One of only a couple of circulating live recordings with Barrett, this purported audience master has its sonic issues but all in all is an enjoyable and sometimes hallucinatory experience. The vocals are unfortunately nonexistent for the most part, but the instruments are clear and well balanced. I believe the field recording must have been recorded 'behind' the PA speakers, hence the lack of vocals. 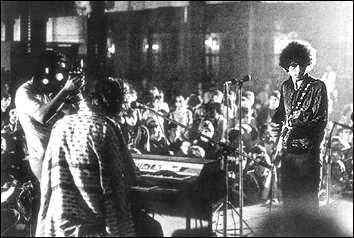 The concert took place at the Star Club in Copenhagen on September 13, 1967 the last night of a three night stand. 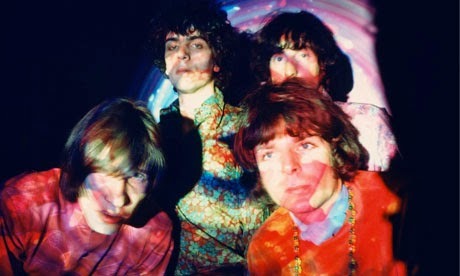 This is a rough and ready document of the Pink Floyd in their embryonic stages as space splitting psychedelic sonic travelers. A quick 'thank you' from the stage and the band begins 'Arnold Layne', their first single release. A well played black light psychedelic classic, unfortunately here the vocals are obscured. What the tape does capture though is a fuzzy stomp and a syrupy collaboration that puts to shame the sometimes contrived efforts of contemporaries likes the 'Rolling Stones' and the 'Beatles'. This version of 'Arnold Layne' does stay close to home as far as arrangement, but is a nice sampling of early live Floyd. A short bit of tuning and a Waters introduction and then the band enters 'One In a Million', another unreleased Barrett song. 'One In a Million' is a shady flat line stomp that leaves a waxy trail in its wake. The vocals are improved on the tape somewhat on this song with Barrett on lead and being supported on the chorus by Waters (I think). A scratchy static washboard rhythm, deep rich bass and roughly textured keyboards are the chemical make up of the song. Mason keeps a bricklayers beat ( I wish he came in a bit clearer) and at four minutes initiates comets starting to streak and the song losing its gravity. Invisible doors open, spectral shadows hide for cover and the sinister vocals again return, edgy, a group of druggy punks. A restrained round of applause is received before the band begins 'Matilda Mother'. Richard Wright takes on vocal duties for the stratospheric fairy tale. The liquid light song reveals its central change perfectly, Wright moans, puddling organ flourishes while Waters and Barrett envelope themselves in a delirious tumble through spilled paint. The song builds to a raving climax, a wash of sound steered through the multi-colored fogs by Waters deeply rooted bass. The song concludes in a weightless drift with the three drum-less instrumentalists embracing arms around an alien sun. Heavy. Another unreleased' Floyd track follows with , 'Scream Thy Last Scream' a tribal and erratic track that was slated to be a Floyd single and one of Barrett's final contributions. Here it is given a sludgy but well arranged workout. Barrett's Danelectro guitar drags its silvery nails across the Waters/Mason rhythm section. The song rotates, a crystal hung in direct sunlight, spectral moments captured and dispersed. Everything is breathing with the organic drone that slowly gains purchase. First Wright, then Barrett discover glistening pieces of found sound from the aural rubble. Mason gets excited and begins to pummel his kit, Waters stutters on a scale before strangling his instrument in satisfaction. The band coalesces into a bubbling melt landing in a a trippy restatement of the songs theme. 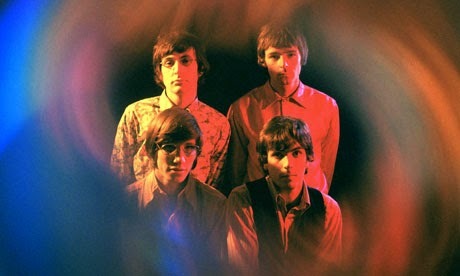 Soon to become a Pink Floyd classic, the concert closes with the first song off of their debut LP, 'Astronomy Domine'. 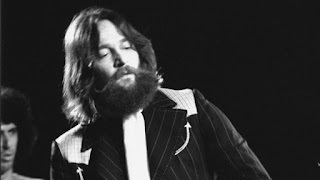 Another Barrett penned number, the song became a concert favorite when he was in the band and continued to be played into the early 1970's. The version here is a dynamic attack with the entire band showing an attentiveness and high concentration to performing a great version. Barrett plays of series of flashing quotes on the theme with Waters mirroring them in kind. The tension builds as Floyd tug at the edges of the song building the anticipation before relieving themselves in the chromatic howling chorus. The concert ends in a sticky downhill tumble before the band lands perfectly into a lush green pile of ancient sticks and stones. 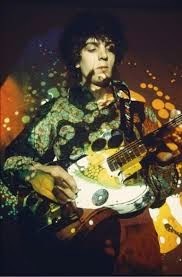 While this concert takes place toward the end of Syd Barrett's tenure with the Floyd, the concert still finds Syd in fine form and at moments displaying other worldly guitar communications. The rarity of the song choices as well as the performance and recording make this unique concert a must have for any psychedelic music collection. The existing recording also proves the there are always differing views of history as the band sounds strong, as well as breaking new ground throughout the concert. Many reports have Barrett being a deterrent to the group during this era, which he may have been, just not on this particular night. The original four piece Floyd on an ancient tape is the stuff dreams are made of. For those interested, also hunt down the November 13, 1967 recording from Rotterdam which also finds the Barrett led group enjoying an extremely hallucinatory evening. That recording is sonically similar to this reviewed recording and likewise features an incendiary display.